Sampler Quilt 2 class finished two weeks ago. It was a glorious ten weeks putting together this beauty of a quilt top. I don’t think I’m the only one from the class suffering from a bit of withdrawal. Thursday nights just don’t feel the same. 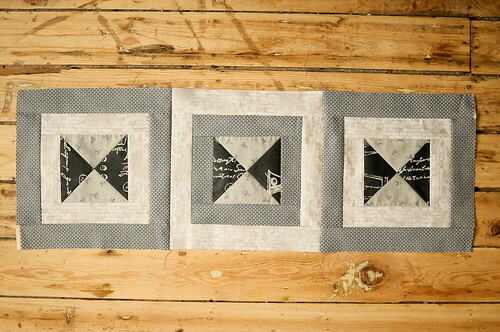 Sampler quilts are tricky, since there are so may different elements going on. I found myself trying to choose very plain fabrics and somehow, I hardly put any mustard coloured fabrics into this quilt. I really wanted to, but it just didn’t seem right. My fellow students, on the other hand, chose brilliant, bold colours and fabrics that I am totally in awe of. Spend some time checking them out here. Also, check out Katherine’s quilt top that I didn’t get a chance to photograph myself. They are all wildly different! I spent one long night working on the back of my quilt. I decided to use my improv techniques to make something on a larger scale that would fit across the back. 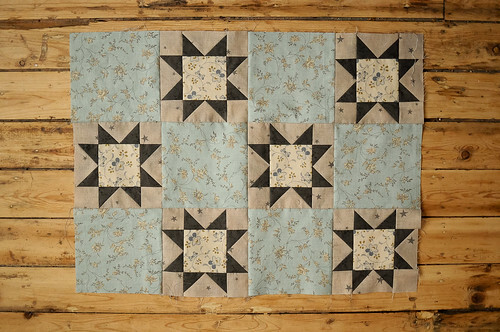 I used scrap pieces from four different fabrics to create that pieced bar. I’ve started to pay more attention to my improv process since I know so many of you are interested in how I do it. Perhaps with a bit of nudging there will be an improv class on our schedule. The quilt is now basted and ready for quilting. I am going to do my best to get going on this sooner than later. 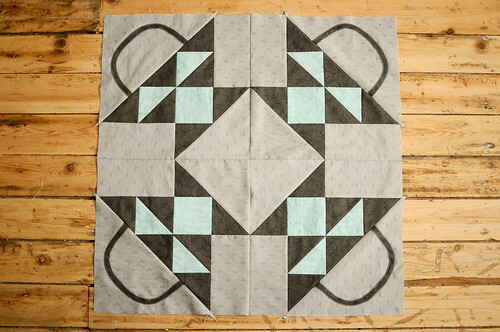 I’m thinking some simple machine quilting echoing the designs will do the trick. Looks so great. I love the color palette you chose, feels so traditional and modern at the same time. wow! great job, karyn! it looks amazing! this is BEYOND beautiful! 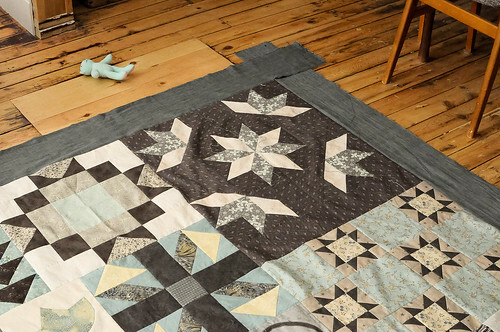 i’m usually not a huge fan of sampler quilts – a lot of elements and colors and overload – but the muted colors are perfect and all of the blocks seem to tie together with similar elements in each of them. oh how i wish i could make the trip to toronto to visit your beautiful work space and take some classes. one day! STUN-NING. this one’s a real winner. Oh wow. What great fabric choices. It’s beeeautiful. This turned out to be such a beautiful piece of art! I think the blocks on their own are very pretty but when you get them all pieced together the whole really is more than simply the sum of it’s parts. 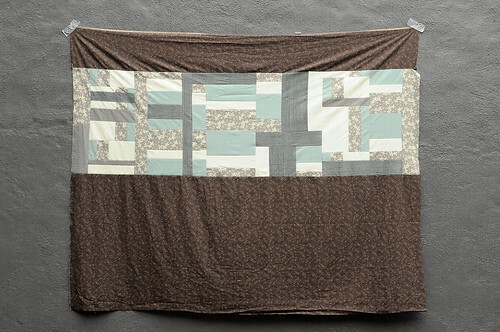 Very beautiful, definitely not your typical ‘candyland quilt’! The railroad crossing square is amazing. Okay, yeah, so is the rest. I like the un-squareness of it. I would like more insight into the improv process. I also would like my basement cleaned up enough that going down to work isn’t an ordeal. I guess I’ll have to start at the beginning. 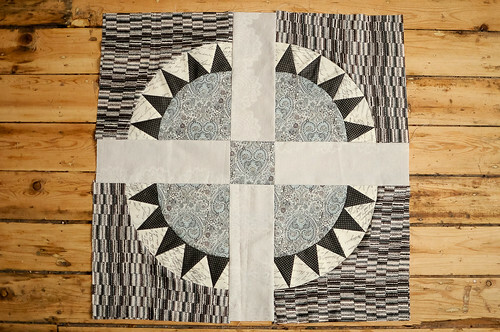 the sampler class – you make it look so much fun. Simply beautiful. 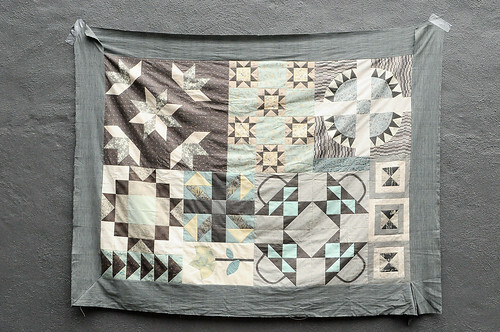 I’m not usually a fan of sampler quilts but I love yours.